The Home, the roots of the Brattisani family is in a small village called di Borgo val Di Taro, near Rovinaglia, Parma, Emilia Romagna Italy. This is where the roots of the family lie and still lie as there are descendents with this surname living in this area even today. 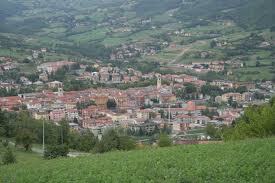 It lies in a beautiful region in North Eastern Italy. We have learned this fact from Luigi Tagliavino who is the son of Luisa Brattesani who had her origins in San Vincenzo in the vicinity of Rovinaglia. Luigi’s grandfather travelled frequently to Scotland and worked with his cousins in various parts of Scotland. This would confirm that the Scottish branches of the family are all very much. Giuseppe Brattesani, the father of Valentina would also have originated from this region. Joe was born in 1841 and was one of the first Italians from this region to emigrate to Scotland. London of course was the first choice for many immigrants and the Clerkenwell Colony was a home from home for them. But for whatever reasons our branches of both sides of our families chose beautiful Scotland as their new home. 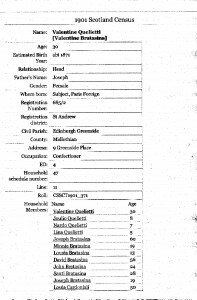 Giuseppe was one of at least six children we have traced to date. There was Giuseppe, David, Angelo, Giulio and perhaps a ‘JOHN’. Angelo’s son Sante was to play a great role in our Quilietti family history. Santi Brattissani married his cousin Valentina Bratissani Quilietti, after the death of her first-husband Emilio Quilietti. The 1901 Scottish Cencus shows us that Valentina had moved to a large flat at 9 Greenside Place, Edinburgh, and with her in the flat, along with her Quilietti children, were many of the Brattisani family. Santi was two years younger than Valentina and we know that he was here with his brother and uncles at that time. Whether the marriage was arranged by the fathers of the two or whether they had an affection for each other we will never know. We do know however that the marriage was disastrous for everyone. Valentina had four years of stillbirths almost certainly caused by the cousin-relationship between them. She died in the aftermath of her last stillbirth in 1905. The Quilietti children lost out on their inheritence because of course all her property would now fall to Sante Brattisani. My father’s sisters moved to New York in the early 1940s and married, one to a Roskowski possibly Rosko. 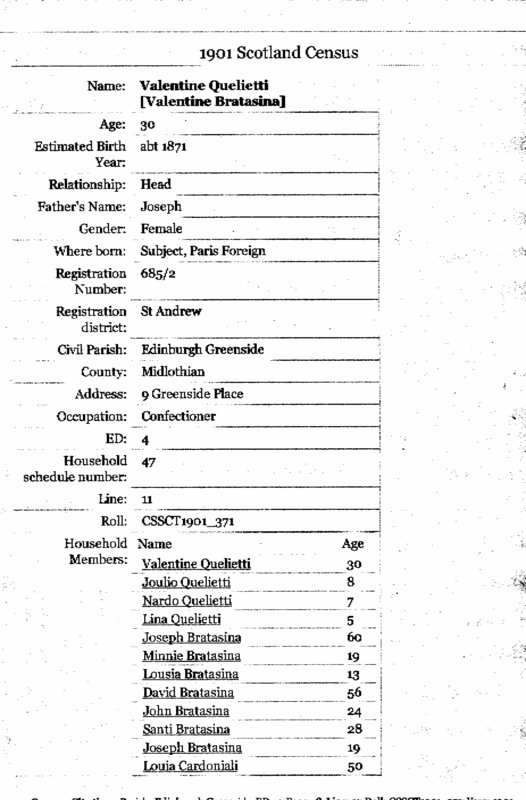 The 1911 Scottish Census confirms that Giovanni was born in America circa 1880. He is shown here with his wife and eight children. The address 254 High Street, Anstruther in Fife. born 1896, and Celestina Brattesani born 1899, on my dad’s side. On my mom’s side, Giovanni Giulianotti born 1891 and Angelina Devincenzi 1890’s? Hope you can help! 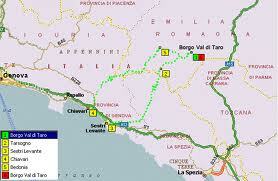 All born in Italy in the Parma or Borgo Taro area. Hello and thanks for leaving your most interesting comment. Hope one of our cousins can help here. Good news is there are many now who have been researching. Did your family stay in Borgo or emigrate also.